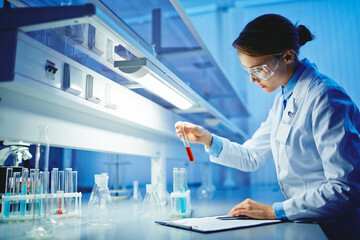 Nowhere is the old adage ‘cleanliness is next to Godliness’ more true than in a science and research-based laboratory. As critical as the laboratory and its resources are, the ability to operate and undertake important research-based work in a sterile environment is even more important. A research laboratory must be sterile, in order to be an efficient, effective, safe and reliable environment in which to work. In an unclean environment, at the very least the data can be wrong, at the very worst, it can be dangerous to the health and safety of its users. Good practices, organised procedures, regular general cleaning, and diligent and knowledgeable users are one piece of the puzzle to ensure these special workplaces are kept optimal. In addition, a regular cleaning schedule by a professional hygiene specialist that has the skills and the equipment specific to servicing these environments, should be employed. From the above, we know that keeping your laboratory clean and therefore safe is vital, but why? Here are some of the most relevant reasons. Keeping your workplace clean and tidy in a general sense is very important for laboratory efficiency. This prevents wastage, spillage, double ordering and will allow each user to find what they need quickly, in an organised environment, so they are able to do their best work quickly. In keeping with efficiency, an organised laboratory with good practices and effective storage and spaces will create the best chance of remaining clean. And a clean environment provides the best foundation to undertake research, leading to the most accurate results and data. An unclean environment, leads to inaccurate tests, inaccurate results, inaccurate data, and inaccurate conclusions. These inaccuracies are costly on many levels – they can waste money, time, resources and provide false positive or false negative results and damage reputations – not to mention potential health impacts. The data will be wrong, the research will be faulty, and it will need to be conducted again or if not recognised, could effect the reputation of the research organisation and/or scientist conducting the research. Sometimes cleaning in a laboratory is only a matter of wiping up dust or some spilled distilled water, however often a laboratory clean involves cleaning up hazardous chemicals or potentially infectious bacteria. In addition to ad hoc cleaning needs, there are also significant benefits to scheduling in regular programmed cleaning services to remove build up and ensure compliance. For these reasons trained hygiene and cleaning professionals are required and health and safety protocol and standards should be put in place. Laboratories often work with various materials that have the potential to be dangerous, especially when in contact with each other. As such, when accidents do occur, it can be reassuring to know that you have a professional industry cleaner who knows the environment, can react quickly and that there has been a past program of regular professional cleaning so that the environment is always kept as safe as possible. Maintaining a high level of cleanliness means the lab is more efficient and in better working order. When people consider costs of running a research laboratory, they most often consider the cost of materials, equipment and the energy costs to run the lab. However, a dirty and unorganised space wastes materials, time and energy and can compromise results and reputation. It slows down workflow and decreases efficiencies. In addition, if laboratory cleanliness is maintained regularly, then it will not become an unmanageable and therefore a more expensive exercise to get it back up to operating standards. Why use a professional industry and hygiene specialist? A research laboratory is a specialised workplace, where skilled work is undertaken by trained professionals. It is important that it is managed and maintained with respect and to the highest standards. Only a professional hygiene and cleaning specialist will have the knowledge, materials and equipment to ensure this. A professional hygiene and cleaning specialist will also have the capability to dispose of the waste that is produced by a research laboratory, in the proper manner, adhering to industry standards and protocols and in a responsible and ethical manner. Jaymak is a national franchisee network that provides professional cleaning and hygiene services including the cleaning, sanitising and maintenance of professional work environments like research laboratories and the equipment and resources used within these spaces. We are the only Australian ISO accredited provider, and we are very proud of this status. It sets us apart from all other hygiene and cleaning specialists in the Australian marketplace. After gaining ISO 9001/22000 accreditation in 2006, we have expanded our cleaning and food safety management systems, which have provided us with the ability to provide a unified national and international standard in hygiene cleaning for all of our clients. By regularly cleaning and servicing your research laboratory facilities and equipment with Jaymak you are acting to create a safe, organised and efficient workplace environment. Contact us today on 1300 529 625 to discuss how we can help protect your business.